Without adding to the ever-growing list of teacher responsibilities, you can improve student test scores according to a timeline that works for your school’s schedule. It’s not just about knowing the curriculum – but knowing how to prepare for and take the test. Participants learn proven test-taking strategies that work. Contact us to learn how to host your own ZAPS seminar or webinar whenever it's most convenient for you! For every session your school schedules, you can also earn financial incentives. The incentive applies to each seminar you book with us. Contact us to learn what your school qualifies for! You can also learn more about what other schools have to say after partnering with Doorway to College Foundation to bring ZAPS seminars to their students! ACT & SAT Classroom Activities: Incorporating ZAPS Test Prep into Your Curriculum is a guidebook specifically designed to help educators like you build college test prep strategies into existing coursework and schedules. Published by Doorway to College Foundation, this resource provides 214 pages of curriculum support for your staff in Reading/English, Math, and Science classes. Great for small- or large-group college prep classes, too! 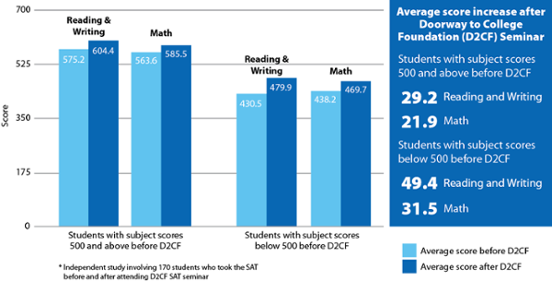 Excellent student performance on standardized tests begins with excellent classroom preparation. Teachers should be included in discussions regarding what they teach. If you're an educator, guidance counselor, or principal, we invite you to read the following documents. Then let us know what you think by sending a note to answers@doorwaytocollege.com. We’d love to hear from you, and what you think about our Trained Educator Program. This counselor-approved information will equip your students to succeed in their future journeys. Each interactive workshop is designed specifically for the needs of students based on specified grade levels. Learn more! Doorway to College Foundation has published a series of free and low-cost e-books for college-bound students and their parents, covering topics such as study skills, college visits, applications and more. These can be shared with your students at key times during their junior high and high school years to help boost their confidence and performance. Browse the collection! There's also a special series you can share with student-athletes, written by a former Big Ten scholarship athlete about how students can boost their chances of playing on a college team — and then succeed in college once they get there. This series of e-books, classes, and webinars will provide your middle and high school students with powerful techniques to make studying effective, efficient, and even fun. 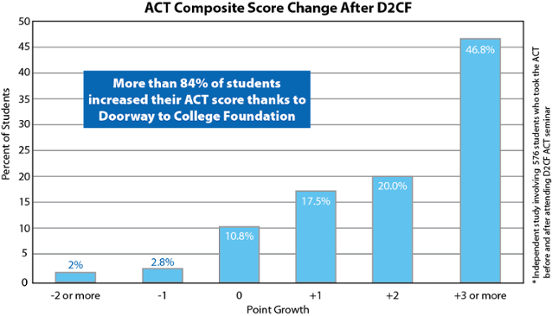 Schools across the country are successfully seeing results from working with Doorway to College Foundation. Check out the results, and find out what they have to say about the experience! Our nonprofit organization is here to help you provide your students with effective, efficient test preparation and create new paths for those who want to pursue higher education. To learn more about how you can prepare your students, contact us at 877-927-8378 or answers@doorwaytocollege.com.